Liz Stamp is a graduate of Cornell University with a BS in Animal Science and came to the wine industry by way of association…or marriage. She has been involved with a family owned and operated farm winery since shortly after it began in 1989. A partner (and Manager) at Lakewood, her main responsibilities involve retail and wholesale sales and marketing activities. 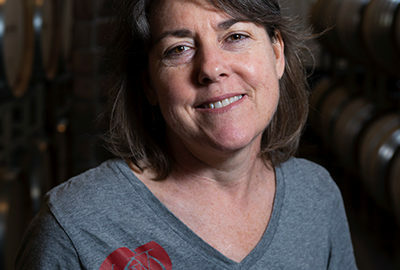 She has always kept abreast of the technical aspects of the wines Lakewood makes, which is facilitated by the fact that she is married to the winemaker. She is involved in a wide range of industry and community organizations. In her spare time Liz enjoys horseback riding, jogging, cross-country skiing, spending time with her family and cooking. Liz and her husband Chris (the winemaker) live just outside Watkins Glen, New York and have 3 children: Benjamin 29, Abigail 27, and Amelia 23, and various pets.